APPPA's most comprehensive pastured poultry training to date featuring six instructors on seven topics. The pastured poultry training course was delivered on January 20, 2019 as part of the Professional Pastured Poultry Conference in Greenville, TX. When you purchase this version of the course, you will receive video presentations, slides, and downloadable mp3 files for each presentation. Important: Access will not be immediate. You will be notified when access to the course is setup. Presenters for this course include Mike Badger, Jeff Mattocks, David Hale, Dave Shields, Paul Greive, and Craig Haney. We’ll discuss why you’re raising pastured poultry and how that might influence your decisions. Instructor: Mike Badger (APPPA). This is the business side of farming. Receive help building and understanding a budget. Uncover hidden costs that affect your future. Instructors: Jeff Mattocks (The Fertrell Company) and David Hale (Windy Meadows). A significant portion of this presentation was interactive with Jeff plugging attendees' numbers into his spreadsheet to help people see the hidden costs of production. Much of that interactivity has been edited out, but you should open "Jeff's cost spreadsheet (included in the course resources) to follow along with the estimating process, and more importantly, enter your own information. You can download an "Enhanced version" of Jeff's spreadsheet which was remixed by Mike Badger (included in the course resources). Understanding pastured poultry infrastructure requirements, tools of the trade, construction, and shelters. Instructors: David Hale (Windy Meadows) and David Shields (Pastured Life Farm). Feed and management information you will need to graduate from producing for friends and family to producing for farm and farmer income! Instructor: Jeff Mattocks (The Fertrell Company). Guerrilla marketing for small farms. How to market your products when you’re starting out and have no money. 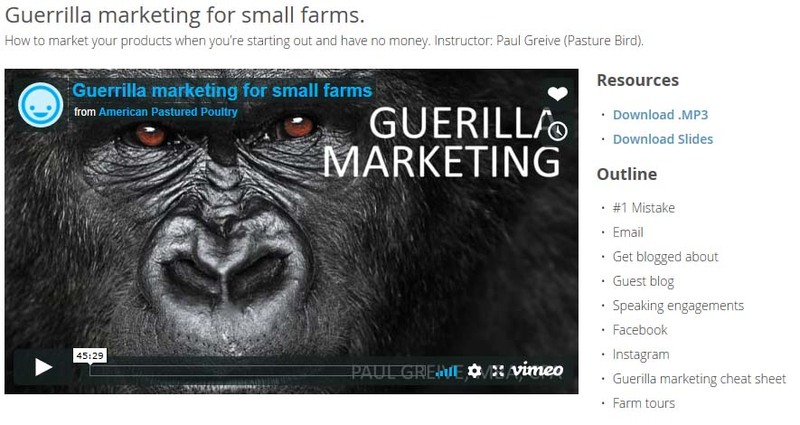 Instructor: Paul Greive (Pasture Bird). Egg handling considerations and resources. Can I sell that? Overview of regulations and resources for selling poultry and eggs. Instructors: Craig Haney (Carversville Farm Foundation). Pastured poultry processing considerations and resources. Can I sell that? Overview of regulations and resources for selling poultry. Instructor: Mike Badger (APPPA / Badger's Millside Farm).